Professor of Media Studies Dr. Sybril Bennett recently participated on a panel, the first in a series entitled “A Conversation about Color.” The event, “How Media Can Shape Perceptions on Civil Injustice, Crime and Punishment,” was held at the John Seigenthaler First Amendment Center. 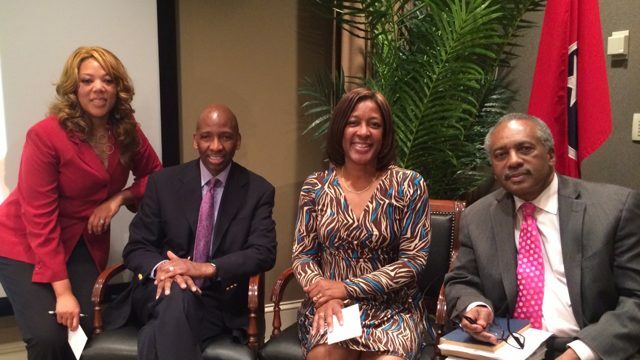 Other panelists included award-winning journalist and retired former Columnist for The Tennessean Dwight Lewis and the Director of the Vanderbilt University Bishop Joseph Johnson Black Cultural Center and author of “Rendered Invisible” and “The Race is Not Given” Dr. Frank Dobson, Jr. The panel was moderated by WTNTribuneRadio COO and Tennessee State University Journalism Professor Harriet Vaughan-Wallace. The event was organized by the Nashville chapter of the National Association of Black Journalists. Belmont’s Media Relations Director for Women’s Sports Kenisha Rhone serves as chapter secretary and was on the panel’s organizing committee. Nationally, Bennett was recently tapped by Emerson College in Boston as one of three external reviewers for the Journalism Department. Closer to home, Bennett returned to Volunteer State Community College where she received her first post secondary teaching assignment in 1995. She was the keynote speaker for the Women’s History Tea sponsored by the Office of Student Life and Diversity Initiatives.